IS IT FIT FOR A BABY? 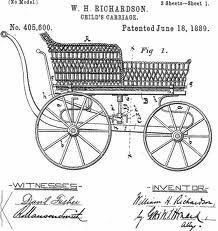 Originally invented by William Kent in 1733, the first baby carriage was made for the Duke of Devonshire. In it’s original form the carriage was egg shaped and pulled by goats, Shetland ponies or dogs. But all that was about to change with the patent given to W.H. Richardson on June 18,1899. His design revolutionized the way infants and toddlers were transported. His design featured a handle that would be pushed by an adult rather than an animal. The body of the carriage could change position, giving the child a view of the adult or the world they were travelling in. He also added in some safety features. This new design featured brakes, axles and springs. Mr Richardson created what would evolve into an industry unto itself! Maybe there are things that you look at differently from others. Things that you can see need some improvement. You never know until you try!